For different reasons, Husserl's original, thought-provoking ideas on the philosophy of logic and mathematics have been ignored, misunderstood, even despised, by analytic philosophers and phenomenologists alike, who have been content to barricade themselves behind walls of ideological prejudices. Yet, for several decades, Husserl was almost continuously in close professional and personal contact with those who created, reshaped and revolutionized 20th century philosophy of mathematics, logic, science and language in both the analytic and phenomenological schools, people whom those other makers of 20th century philosophy, Russell, Frege, Wittgenstein and their followers, rarely, if ever, met. Independently of them, Husserl offered alternatives to the well-trodden paths of logicism, nominalism, formalism and intuitionism. He presented a well-articulated, thoroughly argued case for logic as an objective science, but was not philosophically naive to the point of not seeing the role of subjectivity in shaping the sense of the reality facing objective science. Given the preeminent role that philosophy of logic and philosophy of mathematics have played in transforming the way philosophy has been done since Husserl's time, and given the depth of his insights and his obvious expertise in those fields, his ideas need to be integrated into present-day, mainstream philosophy. Here, philosopher Claire Ortiz Hill and mathematician-philosopher Jairo da Silva offer a wealth of interesting insights intended to subvert the many mistaken idées recues about the development of Husserl's thought and reestablish broken ties between it and philosophy now. I just received my copy of The Road Not Taken. On Husserl's Philosophy of Logic and Mathematics. I have not been able to put it down since I received it yesterday. I had always wondered what was going on with Husserl's colleagues at Göttingen. Finally, I have the details! And I had also always wondered about his early work in mathematics. I've heard the standard sketches and chronologies, but they tend to be pretty thin. In addition to the biographical details, the philosophical content is also gripping and illuminating. I rarely read philosophy books the way I read fiction--they are rarely page turners. For me at least, this was an exception. Thanks for a wonderfully stimulating and important piece of philosophical work. Jeff Yoshimi University of California. 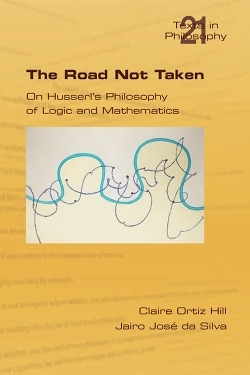 The book makes Husserl accessible for a broader audience educated in the present tradition of analytic philosophy, and as such is an important contribution to the philosophy of logic and mathematics. The Road not Taken deals with a series of topics deserving adequate study in addition to reflection upon each and every one of the readings that both Claire Ortiz Hill and Jairo da Silva propose to us in this extraordinary compilation, which I unhesitatingly thoroughly recommend.